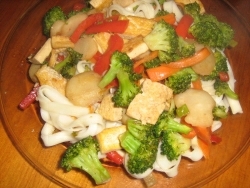 Great tofu recipes provide an easy and fun way to get more protein in your vegetarian diet. Tofu is low-fat and has zero cholesterol. As an example, four ounces of raw, firm tofu has only 95 calories and 10 grams of protein with just 5 grams of fat. It also contains 230 mg of calcium plus lots of iron, magnesium, phosphorous, and potassium. Tofu comes in several varieties - extra firm, firm, soft and silken. The silken is great for desserts and dishes where you really want a smooth blend of tofu to mix in with other ingredients. The firm and extra firm are the best choices for slicing, cubing, grilling, baking and general cooking such as stir fries and soups or toppings. 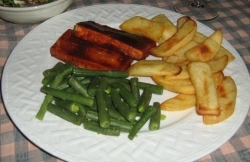 Depending on what tofu recipes you are planning, you will want to choose the right tofu. 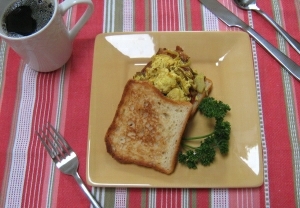 Click for more great tofu recipes... or read on! You can keep tofu in its original package for quite some time but once you open the package it should be used within a week. You can also freeze tofu. We like to freeze it on occasion because freezing it changes the texture somewhat. It actually makes it more chewy so it's great to use for BBQ sandwiches and other dishes where you might want a firmer texture. You will find tofu in the stores, packaged in water. This keeps it fresh and prevents it from drying out. As we said, once you open the package it should be used up pretty quickly - say within a week. The key to cooking tofu is to press it well. It's packed in water, remember? So yes, it is ideally better suited to anything you want to do with it after you press as much of the water out as you possibly can. There are several ways to press tofu. 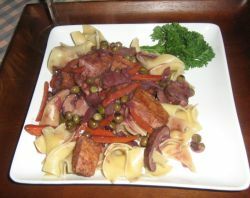 The "old fashioned" way is to simply place it on top of a folded, clean white dish towel or some paper towels. Then place another folded towel over the top of the tofu and press down with both hands. The toweling will absorb the water. Another way we have seen is to place a heavy pot, such as a Dutch oven filled with water on top of the towels and allow it to sit for an hour or so. However, the best investment you will ever make for pressing tofu is to buy a tofu press. There are several manufacturers who sell tofu presses but we prefer the simple but effective design of the Tofu Xpress. When you place a block of tofu on the Tofu Xpress and set the spring you can simply place it in the refrigerator and wait a few hours, ideally overnight, and the tofu will be pressed to a nice density. The container holds the water until you dump it away and then you are ready to cook! This is a great kitchen tool.